Did you know that a well-designed influencer marketing campaign can get yield 11x better results than a traditional advertising campaign? The World Federation of Advertisers reports that 65% of brands plan to increase their spending on influencer marketing in the next 12 months which really doesn’t come as a surprise since 88% of customers trust online reviews even by complete strangers. All these stats point to the obvious fact – influencer marketing is huge and it’ll only get bigger in the coming years! It’s a marketing strategy where brands team up with people who enjoy a large following on the internet (social media in particular) to promote their product and services. It’s a brilliant approach to marketing that works most of the times because consumers trust the influencers they follow on social media and happily purchase the products they recommend. The problem for brands, however, is to find the right influencers who actually have enough influence on their audience to alter their buying decisions. You can’t simply choose an influencer based on his/her follower count or website traffic. You need to consider several other factors and take a holistic view of a user’s influence before deciding to team up with them. This is where the right influencer marketing tool will bail you out. It’ll help you find the top influencers in your industry and give you sufficient data from past campaigns to help you make informed choices. Here are some of the best influencer marketing tools you can start using right now. Heepsy is one of the top influencer marketing platforms that lets you find the most relevant influencers for your product and target audience. It is effectively a search platform where you can find influencers anywhere in the world based on their industry, their popularity on different social platforms, the nature of their following and the average engagement (likes, comments, shares) on their content. Heepsy also gives you a cost estimate for every influencer which makes it a lot easier to find the right influencers within your budget. You can start using the basic version of Heepsy with a free account or upgrade to the premium packages starting from $29/month. 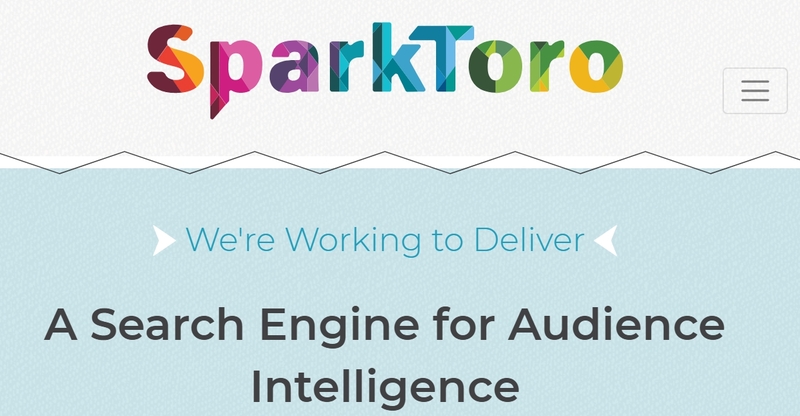 Sparktoro is an audience intelligence platform founded by Rand Fishkin who has previously established Moz, one of the most popular and widely used SEO tools in the world. Sparktoro is still a project in progress with new features coming every few weeks but it’s already making waves in the influencer marketing space because of its innovative features like Fake Follower Audit and SparkScore that show you the true influence of a social media profile. You can use it to run background checks on different social media users and determine whether a potential partner has enough influence over your target audience or not. The tool is completely free to use for now but will probably introduce its premium version in 2019. Upfluence is another powerful influencer marketing tool that not only helps you find the right influencers to promote your brand but also allows you to manage large-scale influencer campaigns spread across different channels. One of the striking features of Upfluence is its modern look and user interface that makes it really easy to understand the platform even for first-time users. Plus, it offers in-depth analytics to measure and track the performance of your campaigns and optimize your spending. BuzzSumo is a popular content marketing research tool that lets you find the most popular and frequently shared content on any given topic. But it’s also very useful influencer outreach tool because it helps you find the top social media influencers for any topic. It also shows you the people with the highest engagement on their social media posts for your target topics and industries, and lets you maintain outreach lists and export influencer for further processing. However, with its basic premium plan starting from $79/month, BuzzSumo is an expensive tool as compared to some of the others on this list. Curalate is an innovative social selling platform that integrates product links with social media posts and makes it easier to monetize your content. To amplify sales, Curalate helps you connect with the right influencers in your industry who can expand your content’s reach and drive more sales for you. It gives you an influencer dashboard where you can analyze the effectiveness of an influencer’s profile based on their followers, engagement and reach. BuzzStream is among the most popular influencer marketing tools and has been around since the beginning of the influencer marketing boom. It gives you a holistic view of an influencer’s impact by helping you find and measure the engagement levels on their blogs, websites, and social media profiles. 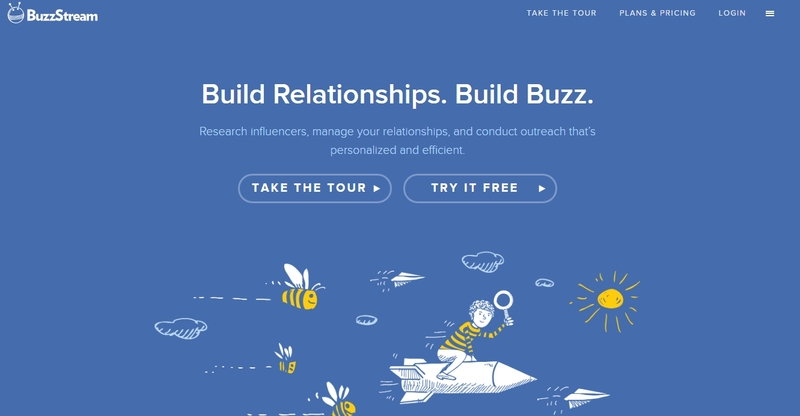 It also has a built-in outreach platform that you can use to list, manage, and approach the most relevant influencers for your outreach campaigns. You can start using BuzzStream for as low as $24/month. NinjaOutreach has seen phenomenal growth over the last few years. It’s a complete outreach and influencer marketing solution that has an outrageously large (and growing) database of blogs, emails, and social media profiles. It’s particularly popular among bloggers and affiliate marketers, but also has a pretty large startup customer base. Using NinjaOutreach, you can not only find the most relevant influencers for your brand on Twitter, Instagram, and other social networks but also reach out to them directly from the tool using their pre-tested and proven outreach email templates. You can access a single user account on NinjaOutreach for $52/month or purchase unlimited user access starting from $74/month. 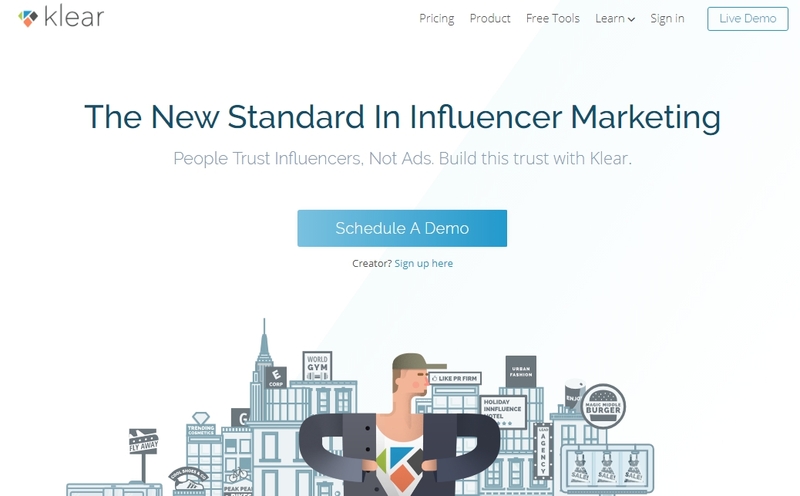 Klear is among the most sophisticated influencer marketing and management tools on the web. It has a database of millions of influencers from thousands of different industries all around the world. It gives you access to real-time data, social media trends, and analytics to help you create more precise and effective influencer marketing campaigns. Due to its large database, Klear is the perfect tool to find micro influencers who’re might not have millions of social media followers but their small yet dedicated following makes them ideal for targeted brand promotions. Awario is primarily a social media monitoring and listening tool that helps you keep an eye on your brand mentions and track any conversations about your product. However, it also gives you the option to find the most popular and engaging influencers for different topics and industries. It also gives you detailed analytics and metrics about any influencers that you find so that you can choose the ones that are the most suitable for your campaign. The basic package of Awario can be used for $29/month. 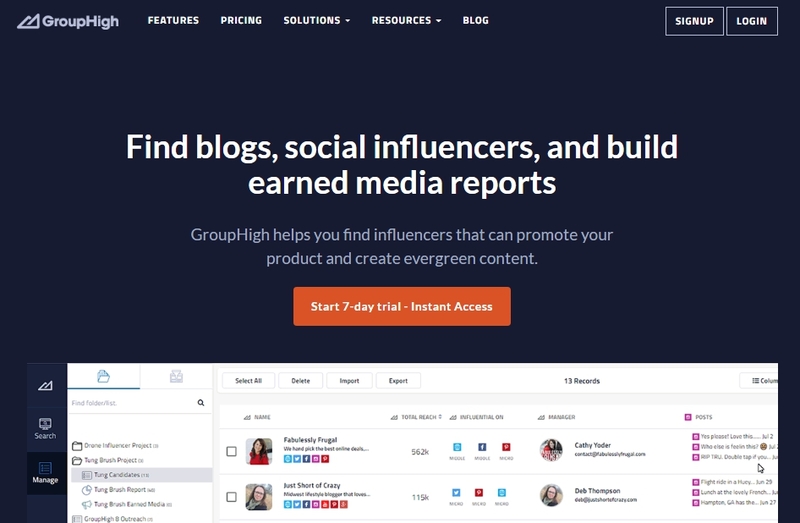 GroupHigh is so much more than a simple influencer outreach tool. It’s a complete digital marketing platform that covers everything from content marketing and social media to influencer marketing and outreach. It has a database of over 50 million websites and blogs, and hundreds of thousands of social media profiles from where it finds the most relevant influencers for your target industry. It’s best suited for agencies and brands that plan to extensively invest in influencer marketing. Traackr is another enterprise level influencer marketing platform with a huge database of websites and social media profiles, and a complete suite of tools create, measure, track, and analyze influencer marketing campaigns. With Traackr you can find everyone from celebrities to micro influencers in your niche with a few searches, organize them into groups based on interest, and reach out to them for potential partnerships. Influencer marketing is here to stay. In fact, most research reports indicate that brands are only going to invest more money in well-targeted and tailored influencer marketing campaigns that can help them reach their audience at the grass root level. Using the tools I’ve shared in this post, you can stay ahead of your competitors and leverage this innovative marketing strategy to grow your business. 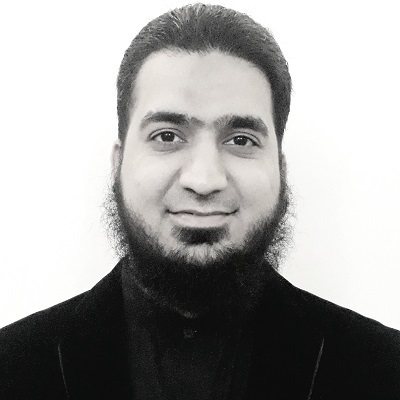 Jawad Khan is a content marketing consultant, a certified inbound marketer and a freelance blogger. He helps SaaS companies, tech startups and entrepreneurs find their voice online and connect with their target audience using high-quality content. Follow him on Twitter and his blog, WritingMyDestiny.